Dedicated to the B.P.O.E of the United States, through Danbury Lodge, #120 by the composer. Hoyt, W. Oland. 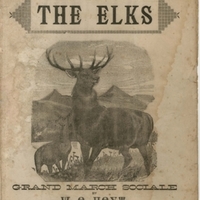 “The Elks Grand March Sociale.” Truman A. Warner Papers, MS026. WCSU Archives, 7 May 2018. Accessed on the Web: 21 Apr. 2019.